A lack of good quality first cut silage, low forage fibre levels and a national shortage of sodium bicarbonate mean that many farmers are struggling with acidiosis problems this winter. Last year, reports from DairyCo indicated that as many as half of all UK dairy cows are thought to be suffering from sub-acute ruminal acidosis (SARA) and consultants stress the problem is no better this year. Dr McIlmoyle says that many farmers look to introduce sodium bicarbonate to the diet to try and mitigate acidosis problems, but points out that such a rapidly soluble rumen buffer may not necessarily be the best solution. “The immediate response to an acidosis problem is to reach for a buffer, usually sodium bicarbonate, for inclusion in the feed. However, in a TMR diet rich in wet silage, sodium bicarbonate can lose its effects as early as in the feeder wagon and can therefore be unable to influence rumen pH,” he says. Dr McIlmoyle advocates the use of a rumen conditioner rather than a straight soluble buffer. 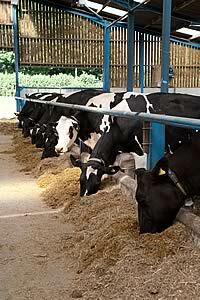 “Specialist rumen conditioners like Acid Buf only break down when acid levels rise. This means its inclusion in the main ration will not adversely affect non acidotic cows, but will prevent rumen pH falling below 5.5 in milkers suffering an acidosis challenge.